Planning a bike trip to the great wide open? You’ll need a bikepack to carry your gear and to get you where you’re going. Bike-specific soft bags are light, rattle-free and tailored to fit modern mountain bikes keeping the load minimal and trail-ready. Frame-bags, handlebar bags or harnesses, seat packs and peripheral bags replace traditional bikepacks. All bikepacks are cleaned and sanitized after every rental, every time. 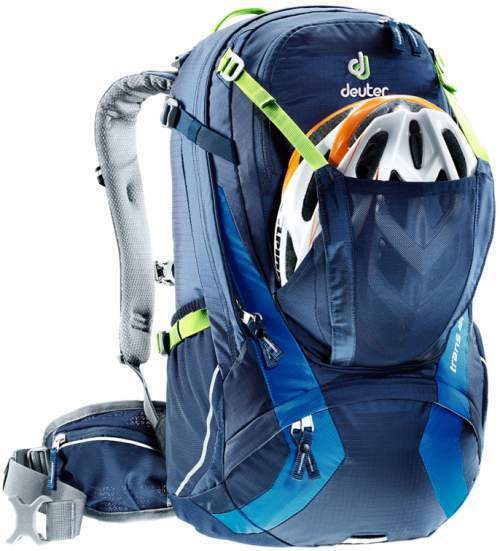 The Deuter Trans Alpine 30 bikepack is an all-around favorite for bike hut trips or long rides. With a sleek, more modern cut, this pack fits close to the body and doesn’t skimp on features. The mobile phone pocket is within reach without having to remove the pack while the large accessible zip openings help keep your gear organized and close by. This bikepack sits comfortably on almost any frame-size whether your riding single-track or a forest road. It is also a great backpack for one- to two-night hikes when you are trying to cut weight. This bikepack has a ton of features designed with your comfort and the ride you have in mind. You’ll find the pack has plenty of outside storage and pockets, and a compact design to not interfere with you bike helmet – an absolute must for any bike trip. This pack is adjustable to fit almost any torso and body size.